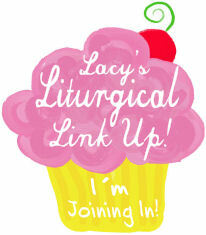 Before we begin the linking, can you take a minute and vote for Catholic Icing as best Catholic blog 2011? I would really appreciate it! Votes last for 1 more week, and you can vote once a day. It only takes a few seconds- no registering involved. Thank you for supporting Catholic Icing! Share your ideas by linking up below! I'm really excited to see what all of you are planning because I'm convinced that the readers of this blog are some of the Craftiest Catholics in the world! :-) Be sure to keep checking back to this post for the new links! FYI: check the spelling on your linkup cupcake. You have a great site; I just found you last week through a facebook friend. Thanks for another great link up, Lacy. It'll take me till Ash Wednesday to get through all the posts! Thanks Lacy for allowing me to link to you. And letting me blog about your pretzels. oh my gosh Lacy. so many links to go and read ! thanks for hosting this link up. And I'm seeing many new faces here (in the links) which is truly wonderful. word is spreading of your wonderful blog. I voted again today. I will have to see if I've got something to link up for Lent. What a wonderful resource of ideas for future years. Thank you! happy to share on your beautiful blog. I just added my link up for Capirotada- Mexican Bread Pudding... a Lenten tradition in our family! Hello and thank you for your last supper Holy Thursday craft. My 5 yo, dh, and I just completed it and we had a lot of fun. Fantastic! I stumbledupon it ;) I am going to revisit once again since i have book-marked it.